AI – hype or hope for the future? Artificial intelligence (AI) is no longer the stuff of sci-fi novels. Machine-learning techniques have long been part of our everyday lives, whether we are searching for something on Google, tagging people in Facebook photos or shopping on Amazon. We are all using AI all the time. But AI is not merely a new technology. It is the science of self-learning software algorithms executing tasks otherwise typically performed by humans. 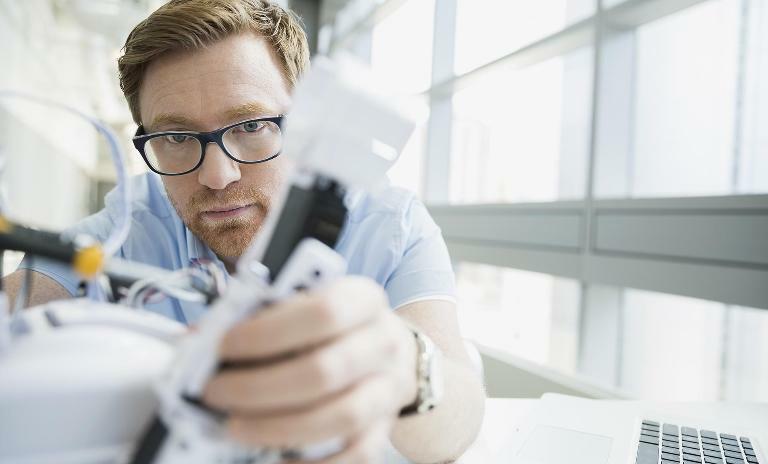 After some disappointing experiences in the past, AI has now reached a tipping point in its development: It is able to autonomously produce critical decisions and predictive insights. Currently artificial intelligence is entering its industrial era. What will it mean for business? Where can it be applied? Massive improvements in deep learning methods have multiplied the possible applications of AI to enhance human performance. As a result, AI is now a matter of concern not only to global technology companies but to every business that aims to remain competitive in its specific market. AI impacts every dimension of our lives. That makes it an amazing opportunity. By delivering automation, efficiency and scalability, AI enables organizations to increase their operational efficiency, improve customer experience and even create new business models. So much for the theory. The reality looks rather different. A lot of business leaders are still unsure how to implement AI in practice. We believe that they are wrong to hesitate. You don't have to be an internet giant in order to fully capitalize on the opportunities offered by AI. Yes, deep learning depends on vast amounts of training data being fed into machine-learning systems, which is why Google, Facebook and the like were its earliest adopters. But for other companies, the important thing is first being able to gather, process and analyze your internal data effectively. The more data you have, the better you can make your product, attracting more users and thus generating more data. That gives first movers in some fields a huge head start on their rivals. Data is important for now, no doubt. But we believe that in future, data will cease to be a defining advantage for companies looking to make big advances in AI. Copious amounts of data are produced every year, and not everything is useful from an AI perspective. Most of this data comes with an 'expiry date' which means it becomes obsolete quickly and ceases to be a source of competitive advantage. In the future, in order to succeed in AI, companies will migrate from data-driven approaches to fundamentally different business models. "With AI we're moving towards a critical mass"
AI creates hope for a better life for everyone – and is also a major opportunity for Europe. CEO of Roland Berger Charles-Edouard Bouée is enthusiastic: "New centers of gravity are emerging, the rules of the game are changing. As far as I'm concerned, it is a positive thing that the leading AI experts are no longer working for Google and the like but are doing independent research and want to set up their own companies." It's time to take the next bold step, Bouée says. "What we need is a research and start-up initiative to accelerate the creation of European centers of artificial intelligence." Simple, manual processes can easily be replaced by machines or robots. With the increasing spread of artificial intelligence, however, it is no longer merely unskilled laborers or workers with few qualifications who risk losing their jobs. With better sensors, greater connectivity and increasing intelligence, automation is making inroads into occupations that were hitherto the preserve of the better-qualified middle classes. So, are we poised to see the "disruption of labor"? Are we heading toward a two-tiered society, with digital adopters on one side and analogue "observers" on the other? Who are the specialists of tomorrow, how will we train them, and how should we manage them? Learn more about our 12 hypotheses on how digitization will affect tomorrow's world of work. Artificial intelligence opens up many opportunities that benefit companies, from automating tasks that were unsuitable for traditional technology to improving efficiency – making instant loan approvals possible, for instance. We help you understand what AI is and what the key stakes are for your business. Together we can identify the impact of AI for your operational efficiency, product pipeline and business model. And we can find quick wins and AI applications that will help you own the future with AI. "AI is not a hammer looking for a nail"
Andrew Hanff, expert for artificial intelligence at Roland Berger, explains how to integrate AI in existing companies - and how to avoid the most critical managerial pitfalls. Managing the unknown? Challenges keep us alive and alert.